Microsoft Dynamics 365 for Finance and Operations enables synchronization of business processes between Finance and Operations and Microsoft Dynamics 365 for Field Service. The integration scenarios are configured by using extensible Data integrator templates and the Common Data Service (CDS) to enable the synchronization of business processes. Standard templates can be used to create custom integration projects, where additional standard and custom fields and entities can be mapped to adjust the integration and meet specific business needs. The field service integration builds on top of the existing prospect-to-cash functionality. The first phase of the integration between Field Service and Finance and Operations is focused on enabling work orders and agreements in Field Service to be invoiced in Finance and Operations. The supported flow starts in Field Service, where information from work orders is synchronized to Finance and Operations as sales orders. In Finance and Operations, the sales orders are invoiced to generate invoice documents. In addition, the information from Field Service agreement invoices is synchronized to Finance and Operations. The Microsoft Dynamics 365 Data integrator synchronizes data by using customizable projects. Standard templates can be used to create custom integration projects where additional standard and custom fields, and also entities, can be mapped to adjust the integration and meet specific requirements. To see an example of how you can synchronize a work order between Field Service and Finance and Operations, watch the short YouTube video How to synchronize a work order with Microsoft Dynamics 365 Integration. The additional functionality in this second phase focused on giving field technicians insight about the inventory information from Finance and Operations, allowing them to update inventory levels and do material transfers. In addition, companies installing or servicing sold goods will benefit from better control and visibility to the full sales and service process with integration from projects. Dynamics 365 for Field Service work orders with link to Dynamics 365 for Finance and Operations projects, apply this project number to the Dynamics 365 for Finance and Operations sales order to allow invoicing from the project. Dynamics 365 for Finance and Operations version 8.1.2 (December 2018) was released in December 2018 and has an application build number 8.1.195 with Platform Update 22 (7.0.5095). Prospect to Cash (P2C) solution for Dynamics 365, version 1.15.0.1 or a later version. The solution is available for download from AppSource. 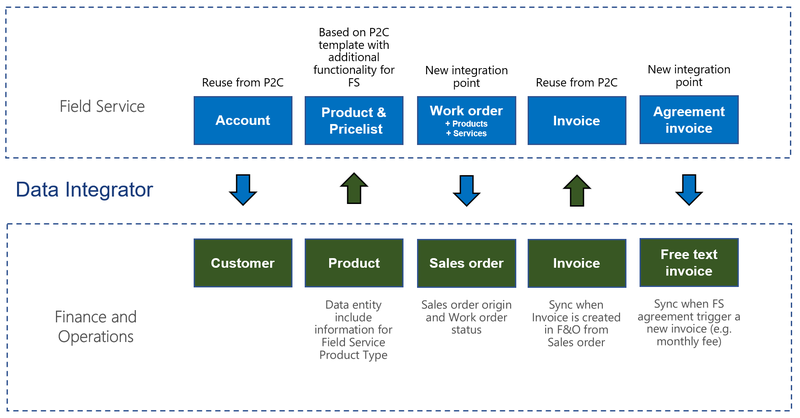 'Field Service Integration, Project and Inventory' solution for Dynamics 365, version 2.0.0.0 or a later version. The solution is available for download from AppSource.